What you need is a safe, affordable place to park your stuff over the summer. Furthermore, you need someone to bring your stuff back for the fall semester. Wouldn’t it be great if you could pack your dorm room or apartment then have a crew come fetch your things from your front door? 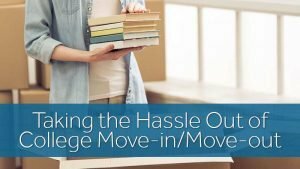 Equally excellent, then, would be having a crew haul your stuff to your new dorm room or apartment again without your having to lift a finger wrangling heavy boxes and furniture out of a truck, across yards and lawns and up several flights of stairs into your new digs. Of course, you would want your things stashed in a safe, secure location, free from the temperature fluctuations of the seasonal changes. You don’t want to have to worry about your storage facility suffering a roof leak from poor building maintenance. Who needs the horror show of mildew in their sheets and sweaters? Plus, you don’t want to worry about how every stranger with a gate code could potentially cut your lock off the door to your storage unit and help themselves to your mini fridge, toaster and hot plate. Believe it or not, help is but a phone call away! Zippy Shell in Columbus knows exactly what it’s like to need certain furnishings and goods for several months, only to have them become a burden for a few more before you need them all over again. With our specialized moving and storage services, we can tailor a plan that’s exactly right for you. With our portable storage units, you can load at your leisure and unload the same way. Or you can choose a plan where you pack, we move, store then return your items to you whenever you are ready at any location you specify. Our storage facilities have no public access, so your stuff is in the best hands. You can enjoy your summer time without having to make regular checks on your traditional self-store complex just to be sure everything is still there and in good shape. Best of all, this month you can get $20 off your monthly portable storage. Just mention this blog post when you schedule your Zippy Shell services to cash in on the deal. Learn the tricks of effective packing here at Zippy U, then contact Zippy Shell today to receive a free quote and make your reservation.